Bronxville's Matthew Rizzo ran U.S. No. 6 all-time in the 1000m. The New York State Indoor Championships was this past Saturday and we witnessed some of the nation's best put up some U.S. top marks. Throughout the course of the meet, there was a total of 560 elite performances. Check out some of the biggest highlights from the weekend below and more from the NYSPHSAA -NY State Champs in the related links below. The junior sensation once again stole the show in the distance events. Tuohy ran a 9:15 to set the meet record in the 3000m. She then doubled back to win the 1500m, running just shy of the meet record but still snagging the win in 4:24.04. In the 3000m there were a total of ten girls who ran sub-10 minutes. Tuohy said she felt comfortable with the double but she did not want to push it too hard with New Balance Nationals coming up. "I just wanted to break the state meet record in the 3K, try and hit consistent splits getting ready for nationals next weekend," Tuohy explained. "The 1500m was just seeing how I was feeling (coming off of the 3K) I felt like I was really strong I had a lot left in me. I just didn't want to push it too hard because my legs weren't fully stretched out." Next weekend at New Balance Nationals Indoor Tuohy plans to run the distance medley relay with her team as well as compete in the 2-mile individually, and possibly the Sprint medley relay. Tuohy said she will try to take each of those races one at a time but if it's in the cards she will be looking to break fellow New Yorker, Bronxville's Mary Cain's 2013 national record time of 9:38.68 in the 2-mile. Although we didn't get to see the head-to-head matchup we were hoping might happen between Matthew Rizzo and Matthew Payamps, we did get to see two of the nation's top distance athletes represent well in their respective events. 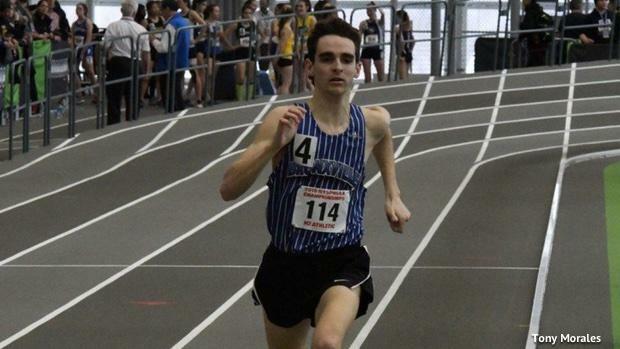 Bronxville's (NY) Matthew Rizzo ran one of the top all-time times in the boys 1000m on Saturday at the New York State Indoor Championships. Rizzo ended up winning the 1000m running 2:24.06 almost ten seconds faster than second place Smithtown West's (NY) Michael Danzi 2:32.08. Rizzo's time ranks U.S. No. 6 all-time and he ran it alone. His time ranks just behind George Kersh of Pearl, Mississippi who ran 2:23.85 in 1987 and just ahead of South Lakes' (VA) Alan Webb's second time on the all-time list a 2:24.13 which he ran in 2001. After his big U.S. No. 2 all-time 1K performance last weekend at the USATF Indoor Track & Field Championships St. Anthony's (NY), Matthew Payamps turned his attention to the 1600m at the New York State Indoor Championships. Payamps came in as the favorite this weekend having run 4:12.39 for the full mile indoor earlier this year in Boston at the New Balance Indoor Grand Prix. His biggest challenge came from Matthew Rizzo's brother, Alex Rizzo of Bronxville (NY) who had run a 4:12.89 full mile earlier in the year at the Millrose Games. Payamps ended up taking this matchup running 4:10.51 while Rizzo was just behind him in 4:13.21. Matthew Rizzo and Matthew Payamps haven't raced in a head-to-head match-up since the Marine Corps Holiday Classic 800m where Payamps had the slight win over Rizzo running 1:54.73 to Rizzo's 1:54.92. We might not see them match up again this season as Rizzo is entered in the 800m at New Balance while Payamps is entered in the mile. One place we will see both of them represent their teams is in the distance medley relay on Friday night. Either way, both of these guys have had a stellar season and will look to represent the state of New York well on the national stage. The boys 600m race at the New York State Indoor Championships was one for the ages. The race had five guys run times in the U.S. top ten and 11 in the U.S. top 50. Leading the way with a U.S. No. 4 performance was Freeport (NY) High School's Kevon O'Brien Smith. O'Brien Smith PR'd by almost two seconds from his previous best of 1:21.38 which he ran earlier this season at the Stanner Games. In the girls, 600m Spencerport's (NY) Vanessa Watson was looking to reclaim her state title but Corning's (NY) Lindsey Butler had other ideas. The duo had previously raced at the Millrose Games where Watson finished third but only a few tenths of a second ahead of Butler. Butler felt she could hang with Watson again but this time she went out looking for the win. "I knew that we were kind of on the same level and that it would take everything that I had to beat her," Butler explained. "My original plan was to stay ahead of her as long as I could, but we got about 300m into the race and she passed me. Running with her at Millrose I got stuck in the second lane so I knew if I just stayed right behind her and use that last straight away to get ahead that I could outkick her." The race came down to the wire with the straightaway deciding the finish. Butler came out on top with a PR and the win running 1:30.00 and Watson running 1:30.22. Their times rank U.S. No. 3 and 4 respectively. Up next, Butler will turn her focus to the 800m while Watson will turn hers to the 400m at New Balance Nationals Indoor. Mt. Sinai (NY) High School's, Kenneth Wei is the top long jumper in the nation Wei holds the nation-leading mark in the long jump with his 25-foot jump at the Section 11 County Champs. This weekend at the New York State Indoor Championships he didn't quite jump that far but still took home the win jumping 23-05.50. Placing second was Cicero-North Syracuse's (NY) Jeremiah Willis who was only .25 inches behind Wei with a jump of 23-05.25. Wei also took second in the 55m hurdles running 7.45 behind Victor Central's Michael Bayley who took the win running 7.44. We got to witness the emergence of yet another young potential sprint star in Tapestry Charter School's (NY) Jada Kenner. The seventh grader may only be 12-years-old but she was putting up times with the seniors. In the 300m Kenner ran the second-fastest qualifying time of 39.65. In the finals, she went even faster running 39.24 for U.S. No. 17 and the win. It's possible that Kenner is the youngest ever New York State Indoor Champion. She is the only seventh grader in the top fifty for the 300m. Kenner also ran in the 55m dash prelims clocking a 7.35 just off her own seventh grade U.S. No. 1 mark of 7.27 which she ran at the Section 6 State Qualifier. She will be an athlete to keep an eye on over the coming years. Shea Weilbaker (Saratoga Springs, NY) - U.S. No. 9 in the 3200m 9:04.62, leading six other guys to top 50 performances. The title marks Weilbaker's third New York State 3200m title in a row and second indoor state title. Jeremiah Willis (Cicero-North Syracuse, NY) - U.S. No. 8 in the triple jump 49-6.5. Dieusi Armand (Westbury, NY) - U.S. No. 9 40-1 in the triple jump. Monique Hardy (Webster Thomas, NY) - She already holds the U.S. No. 1 mark in the weight throw (62-9.5 from the Trent Jackson/Cedric Walker Invite) but she threw 60-04.75 to win which would rank U.S. No. 3. Hardy also won the shot put with a mark of 42-08.50. Ciara Durcan (Pearl River, NY) - U.S. No. 2 in the 1500m race walk 6:48.13. Ursuline School (NY) - 9:07.89 for U.S. No. 4. Five other teams put up new U.S. top 50 performances. Christopher Columbus Camp (NY) - 1:28.05 for U.S. No. 5. Six Other teams posted new U.S. top 50 performances.